Over the past couple of months, I've been reading an interesting book by Paul Taylor of Creation Today. 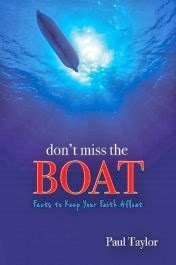 Don't Miss the Boat: Facts to Keep Your Faith Afloat is published by Master Books, a division of New Leaf Publishing Group. Read four fictional short stories that place the reader back in time just before the Flood-showing a world filled with non-belief and the few who reached out to save other with God's truth. Don't Miss the Boat provides various perspectives on the biblical account of the Great Flood that speak to both the technical and scientific evidence we see around the world today. This book contains information for the layman who wants to know the basics, as well as the solid evidence that can be shared with anyone. Theological considerations, historical essays, and scientific implications are included, as well as fictional representations that convey the emotional power of God's judgment on a wicked pre-Flood world, rounding out this unique resource. The book and my thoughts: The book is split up into sections, with the first section (of four chapters) being "exposition" where, as the author explains in the introduction, "Science is kept to a minimum." The first chapter is also one of the longest chapters in the book, and for whatever reason, I just had a hard time getting through it. Probably because I wanted to be reading science. The second section (three chapters) was "history" and I enjoyed that. The chapters were pretty short, and it was good to read. The sixth chapter, "Why Our Society Stopped Believing in the Flood" was particularly enlightening. This was the point, actually, where I started seeing this book as truly offering something different. Once I hit the third section (eight chapters) on "science" I was definitely to the part of the book I was interested in. These chapters were short also, and I found myself a bit surprised to be reading things here that I haven't seen elsewhere. The next chapter is fiction, and I thought this was well done. It tells about the time before the flood from the point of view of four biblical characters, and it is most definitely labeled FICTION. I enjoyed this. The final chapter wraps up the book, and is quite short. I'll confess that I skimmed it. This is a book I plan to have my teens read. You can check out other reviews of Don't Miss the Boat at the Master Books Blog.